5 Reasons Not to Convert to Iris Thread » Embroidery Talk Has Moved! Reason 1: Color conversion is not fun – Let’s face it, matching your existing color card to a new thread can be a lot of work and hassle. Even if the new thread supplier offers an online conversion engine you still have to select the color numbers of your old thread to get a match. Plus, sometimes the conversion engine doesn’t supply a match, and then you have to call the conversion experts who’ve been color matching thread for decades and ask them for help in finding a close color match. It’s a lot of time and work. Reason 2: You’ll have to find new uses for the money you save – Your budget for the year is already done, why would you want to have to readjust all the numbers and columns to reflect the cost savings you’ll experience when you purchase Iris thread? If that’s not bad enough, EnMart’s mix and match quantity discount policy means that you can save additional money when you buy as little as 12 cones of thread. You’ll have to find something to do with the extra money. That requires yet more research and decision making. Who wants to deal with that? Reason 3: Reduced down time means more production time. 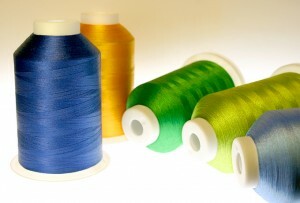 - Iris thread is durable, experiences less thread breaks, and runs more smoothly than many other machine embroidery threads. These qualities make it likely that you’ll have less down time when sewing and experience an increase in production. More production time means you’ll have to find more jobs to fill that time. Do you really need more work? Reason 4: The thread attracts too much attention – Whether it’s the vibrant color and sheen of the Iris UltraBrite Polyester or the dazzling glow of our metallic thread, Iris threads tend to attract people’s attention. Really, who needs more people looking at and admiring their work? Reason 5: Your work will last and last – Provided it is cared for and washed correctly, Iris polyester thread is colorfast, wash fast and durable. It has survived an industrial wash and dry with its color and shine intact, so it’s sure to survive a home wash and dry. This means you’ll miss an opportunity to speak with your customers when they stop by to complain about color runs and color fade. You’ll only be able to talk to them when they tell you how great your work looks, and all that praise could inflate your ego. This entry was posted on Tuesday, July 13th, 2010 at 10:50 am and is filed under Thread. You can follow any responses to this entry through the RSS 2.0 feed. Both comments and pings are currently closed. Reason 6: You’ll have so many customers raving about your work, there’ll be a line of new orders out the door. Who has time to deal with all those new accounts? Reason 7: Money is so heavy. You’ll have to carry it all to the bank! And all that credit card data entry? Who has time! O.k., now you’re giving me an idea. Maybe we should have a contest, come up with the funniest reason not to use Iris thread. The winner of the contest wins, what else, some Iris thread. I shall have to ponder this. Reason 8: Once you try a spool, you’ll want to buy one in very color! That’s a good addition Lenae! I like it!